A Caring Cradle is a cooling unit that allows grieving families to spend more precious time with their babies whom have passed away. The Hermans are grateful for being able to use a Caring Cradle at Miami Valley Hospital South when their son, Lincoln Matthew Herman, was stillborn on April 13, 2018. Because they had the Caring Cradle, the Hermans were able to have three days with their son to hold him, take photos, and make memories. 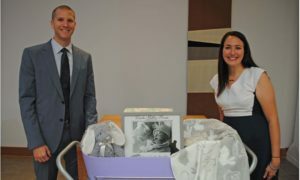 They quickly decided this was the gift they’d donate in memory of baby Lincoln— a Caring Cradle, the gift of time.